The most desirable exterior building product in America? Brick. And it has been for eons. 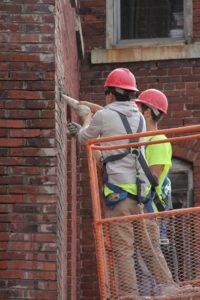 Brick masons helpers are in short supply. And when supply is short, demand is high so you make money. This is a small company where you will learn directly from the Owner. Learn how to: point, flash, butter, parge, and tuck point. Learn how to work hard, sweat, get dirty, and create works of art that last for centuries. will have a desire to be an accomplished brick mason.